Good location. Fine room size. This property is starting to look a little dingy. The bed was so comfortable that we’re thinking of buying one for ourselves. Staff was also very helpful and accommodating. Parking garage was absolutely terrible, too small, creepy, hard to get in and out of. Not fair for the price. Price was certainly right. Day 2 of our trip both our keys didnt work, we were really tired - came back downstairs and told the front desk. The lady at the front desk didnt explain why they didnt work, didnt apologize, no emotion. Upon our arrival the staff was cuddled around the front desk laughing and carrying out while I was standing there waiting to check in. The hotel itself needs a bar or room service or something because there arent many options nearby unless you want to walk a couple blocks. Overall I cannot complain too much because I feel like I got what I paid for. I love this hotel. I hope you will continue to keep your prices at reasonable rates. Orbitz overbooked regular rooms for the first few nights of my stay, so they put me in a suite for 2 nights, which was a pleasant surprise. There was a little confusion about moving my things from one room to the other, but it worked out. Both rooms were clean and comfortable. Hotel staff was great, especially the front desk staff. great hotel! great hotel!great hotel!great hotel!great hotel!great hotel!great hotel!great hotel!great hotel!great hotel!great hotel!great hotel!great hotel!great hotel!great hotel!great hotel!great hotel!great hotel!great hotel!great hotel!great hotel!great hotel!great hotel!great hotel!great hotel!great hotel!great hotel!great hotel!great hotel!great hotel! Not a good hotel for food, for comfort, no coffee bar except for morning and then to pay for. No doorman . This is a bare bones place, in reality. Staff is nice but not given the tools to be good. Disappointing. Don’t use it unless you want nothing but a room. It's a good location but rooms are old and in need of update. Do not stay here if you are looking for anything other than a place to rest your head. Nice hotel, great price, great location, friendly staff. Nice place to stay at for a night in New Orleans . 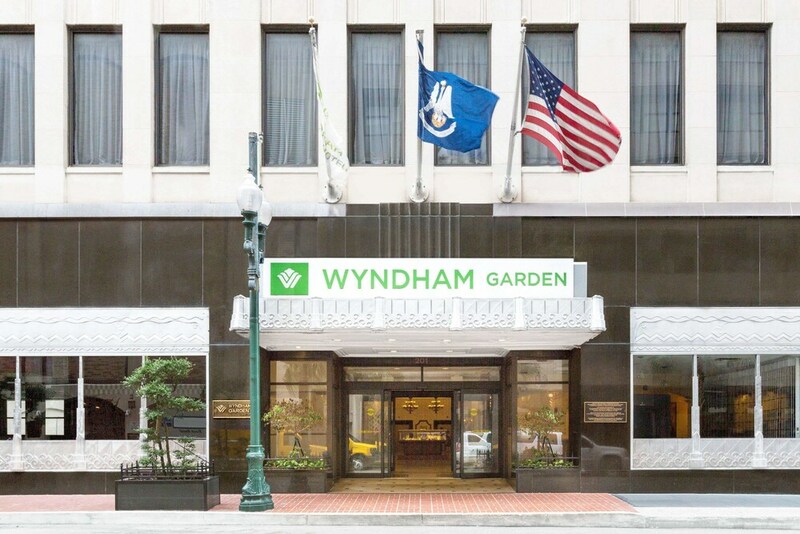 Located in Central Business District, Wyndham Garden Hotel Baronne Plaza is adjacent to Canal Street and within a 5-minute walk of other popular sights like Bourbon Street. This 170-room, 3-star hotel has a coffee shop/café, free in-room WiFi, and a fitness center. For your convenience, a continental breakfast is available for a fee. Get a pick-me-up at the coffee shop/café. Guests can expect to find free WiFi and 32-inch a flat-screen TV with cable channels. The pillowtop bed provides a full night's sleep and the bathroom offers hair dryers. Other standard amenities include a refrigerator, a coffee maker, and free newspapers. Wyndham Garden Hotel Baronne Plaza features a fitness center, free WiFi in public areas, and a business center. Valet and self parking are available, and there's also limo/town car service. The front desk has multilingual staff on hand 24/7 to help with tours or tickets, securing valuables, and luggage storage. Other amenities at this historic hotel include a banquet hall, a fireplace in the lobby, and a porter/bellhop. Recreation features at Wyndham Garden Hotel Baronne Plaza include a fitness center. The preferred airport is New Orleans, LA (MSY-Louis Armstrong New Orleans Intl. ): 23-min drive, 15 mi/24.1 km.